Republicans offer more detail on their finding of no collusion, Democrats say they didn't push hard enough. WASHINGTON — The House Intelligence Committee on Friday released the final full report on its controversial investigation into Russian interference in the 2016 election, detailing work that led Republicans to conclude there was no evidence of collusion with the Trump campaign. Democrats on the committee said the final 250-page document only shows the lengths to which GOP leaders went to shield President Donald Trump and his top allies from scrutiny, and used their own rebuttal to introduce to the public new information about repeated Russian efforts to establish contact with key Trump campaign officials and Trump himself. And they say Republicans refused to press key witnesses for further testimony or documentation that might have further established the Trump campaign’s complicity in an effort to tilt the election against Hillary Clinton. Republicans, too, had complaints Friday. 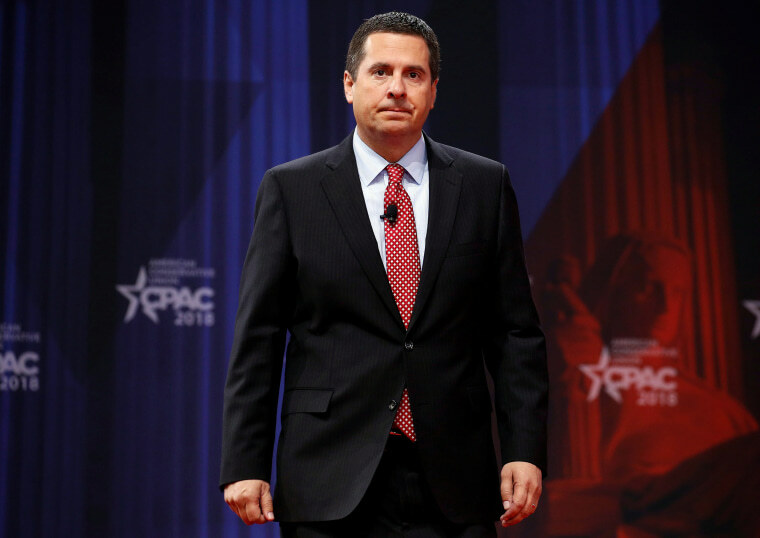 Rep. Michael Conaway, R-Texas, who led the committee’s Russia probe, and Committee Chairman Devin Nunes, R-Calif., were strongly critical of the intelligence community for the significant number of redactions they made to the document, and said they would press to make more information public. The committee voted along party lines in March to formally close the Russia investigation, after just more than one year. Democrats have continued to press ahead with their own investigation, which included an interview just this week with Cambridge Analytica whistleblower Christopher Wylie. The final report, drafted by the Republican majority, does criticize some Trump campaign officials for taking “ill-advised” meetings with Russians, some with links directly to the Kremlin. It acknowledges that Donald Trump Jr., Jared Kushner and Paul Manafort expected to receive “but did not ultimately obtain” information from a Kremlin-linked lawyer that could damage the Clinton campaign. It also notes that Donald Trump Jr. “briefly met” a Russian government official at National Rifle Association conference, but says there was “no evidence” that they discussed the presidential election. The report does strongly criticize the Obama administration for in its view failing to adequately confront Russian efforts to meddle in the U.S. election. It also repeats charges of a memo drafted by Nunes that the Justice Department misled a judge in its effort to obtain a secret surveillance warrant on Carter Page, a Trump foreign policy aide. To cast doubt on the idea that Trump campaign officials actively cooperated with Russians, it points to the Trump transition team’s attempt to establish a back-channel with the Russian government to suggest there was no existing relationship by that point. Democrats contend a more rigorous investigation would have shown otherwise. In their “Minority Views” report that was also released Friday, they point to a strong possibility that then-candidate Donald Trump himself was communicating with his son as he worked to schedule the now-infamous Trump Tower meeting in June of 2016 with Natalia Veselnitskaya, a Russian lawyer. Their report also details how George Papadopoulos, dismissed by Trump advisors as a low-level “coffee boy,” was regularly in touch with Kremlin-linked individuals and top Trump officials during both the campaign and transition. Papadopoulos was informed in April 2016 that the Kremlin had “dirt” on Clinton in the form of emails, well before the Clinton campaign or DNC officials were aware of hacking. And the Democrats’ findings include efforts by the Kremlin to establish a “first contact” with the Trump campaign through an intermediary at the National Rifle Association. In May 2015, the NRA member reached out to Rick Dearborn, a longtime aide to then-Sen. Jeff Sessions, R-Ala., now the attorney general, to inform him of Russia’s interest in connecting with the campaign. “No collusion, which I knew anyway. No coordination, no nothing,” he told reporters in the Oval Office as he met with German Chancellor Angela Merkel. “I was very honored by the report. It was totally conclusive. Strong. Powerful."